Ann Dixon is the full-time Secretary for Westside Catholic School at the St. Boniface Campus, where she has worked since the beginning of the 2012-2013 school year. 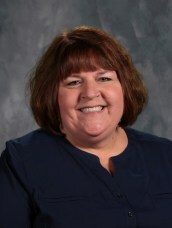 Mrs. Dixon grew up and currently lives in Haubstadt, Indiana. She graduated from St. James Catholic School, Mater Dei High School, and Indiana Vocational Technical College. She has been married since 2000. They have two children. Sydney, who attends Gibson Southern High School, and Jonathan, who attends St. James.